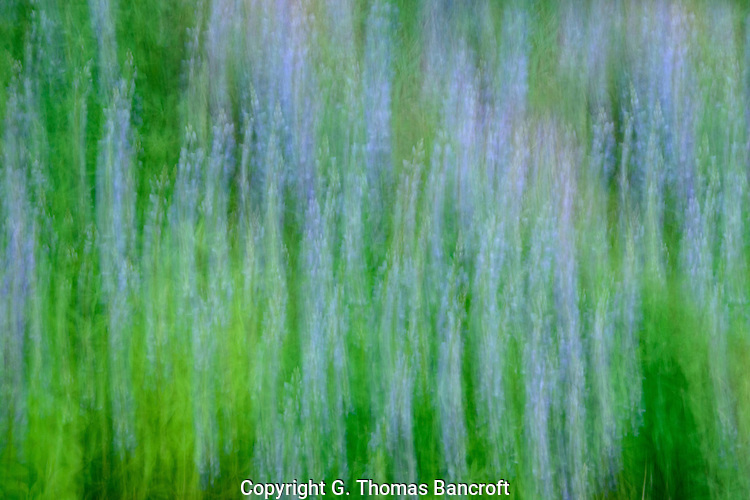 I found a patch of lupine flowers in bloom when I was hiking along Icicle Creek in Wenatchee National Forest. Their purple flower spikes were swaying back and forth in the light breeze. The green leaves, purple-blue flowers and sandy colored pine needles on the ground formed a mosaic of colors. Several patches were along the trail in close proximity. None were very large. 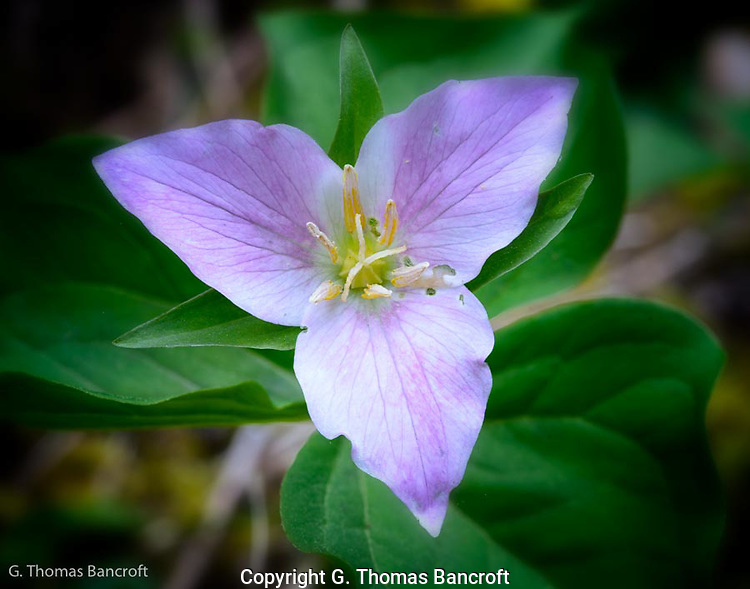 I focused in on one that might have been 10 feet by three feet with several dozen flowers. I felt the color mosaic called for an abstract painting. I blurred the picture to create this impressionist abstract feeling of color, contrast and pattern. I found the setting very tranquil and the abstract tries to capture that feeling. I stood for several minutes just watching the movement of the stems and how the mosaic pattern changed with that movement. It was soothing and mesmerizing at the same time! I finally had to jolt myself back to reality and head along the trail. What emotion does this illicit in me? How does it make me feel? I walked down to Icicle Creek as the sun was setting to find a place to sit and wait for twilight. Twilight is such a magical time of the day. Often the wind subsides for a few minutes as the warmth of the sun disappears and before the chill of the night takes over. A blue cast comes across the landscape, as the remaining light is the blue wavelengths that curl around the surface of the earth. Icicle Creek is on the east side of the Cascades so the sun will dip below the high peaks a little earlier than on the west side and I wanted to see if this allowed twilight to last longer than on the west side. I found a place with a western serviceberry bush in full bloom on the bank of the creek and a scattering of paintbrush plants. A very light breeze was flowing down the creek with the current, a few American Robins were singing softly in the background. I settled to watch the sunset and wait for twilight. The flow in the creek was up because of snowmelt at higher elevations. 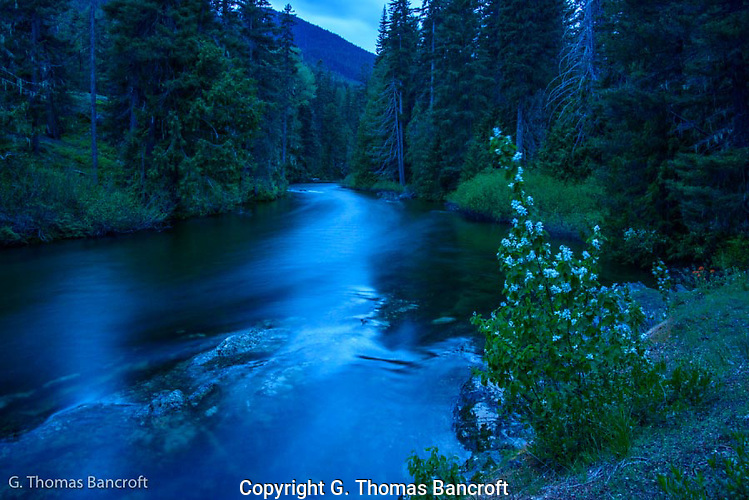 Icicle creek is the major drainage on the east side of Alpine Wilderness Area. Hemlocks, alders and various bushes line the creek. Rocks in the creek bed created small rapids immediate upstream from my spot while a quick drop below me made for quite dynamic rapids. The sound of the rapids was relaxing. As the sunset, the robins stopped singing and except for the sounds of the rapids the forest became very quiet. I had my camera set on a sturdy tripod before the sun went down so I would not have to turn on my flashlight. I took a series of long exposures as the forest moved through the blue twilight to darkness. I sat for an additional 20 minutes after it was dark just enjoying the tranquil setting and the sounds of the creek before I rose to head back to my campsite. I was pleased with the serene mood I captured in the photograph. Let me know the feeling it conveys to you? It is so wonderful to be able to enjoy the wilds of Washington. I was standing at the top of the beach among the drift logs when I heard the chatter notes of a Wilson’s Warbler in the bushes under the trees along the slope. I turned to see it jump from branch to branch singing as it searched for bugs. It made me think about how abrupt and quick the transition is from forest to beach to marine habitat. 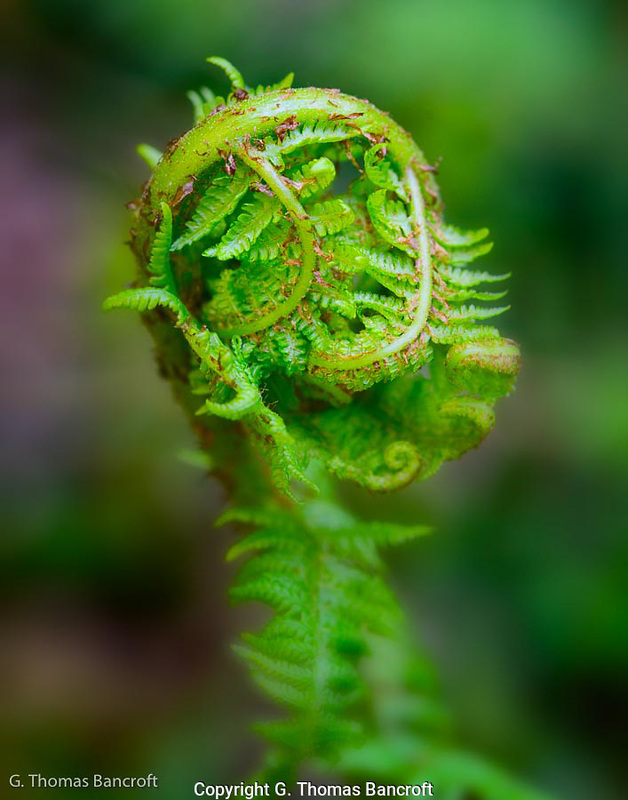 In a short stretch of 100 yards or so, we see a complete change in the ecosystem and the species we might see. Some do cross these boundaries in their quest for survival and reproduction; others like the Wilson’s Warbler are restricted to only one. As I continued down the beach, I heard the cries of a Bald Eagle and looked above to see two Eagles circling peacefully above the beach until a few crows flew up to harass them. One of the Eagles dropped down to land for a few seconds on the beach before it joined the first and they sailed over the rock outcropping and out of sight down the beach. A pair of Black Oystercatchers worked along the edge of the surf probing into the sand for possible morsels. The rolling twitter of a bird caused me to turn and look to see a Whimbrel flying out from the beach to make a broad arch around me and headed north. 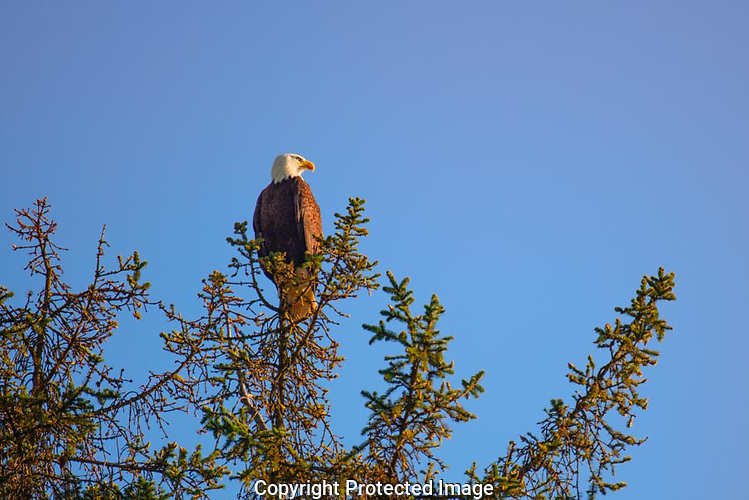 This species is passing through Washington from its wintering grounds to the Arctic for the breeding season. A Harlequin Duck was sitting on a rock in the surf while several male Surf Scoters were actively foraging just beyond the wave line. These two ducks should be heading to their breeding grounds pretty soon. I finally arrived at my destination along the beach; a large rocky cliff that extended out perpendicular from the beach into the ocean. Several sea stacks showed that the cliff had once extended even further. The sandy beach shifted to a rocky shore and I had come to look for tide pools and what I might find in them. These rocks and pools of water can be full of life and you can get quite close to it because they either don’t move or moved very slowly. I had planned to sit to see what new things I could discover by patiently watching the scene. I had an hour before the sun would begin setting and I hoped to watch the sunset from this vantage point. Several Ochre Sea Stars were tightly attached to rocks. 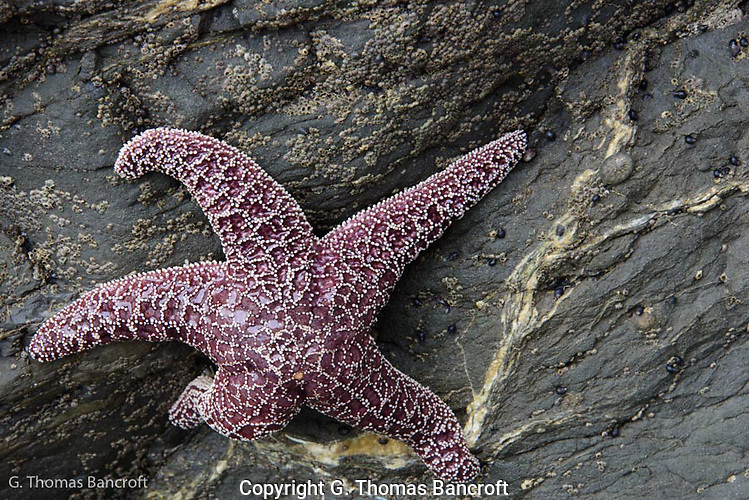 These orange or purple starfish can hold the rocks with their tube feet as waves wash across them. 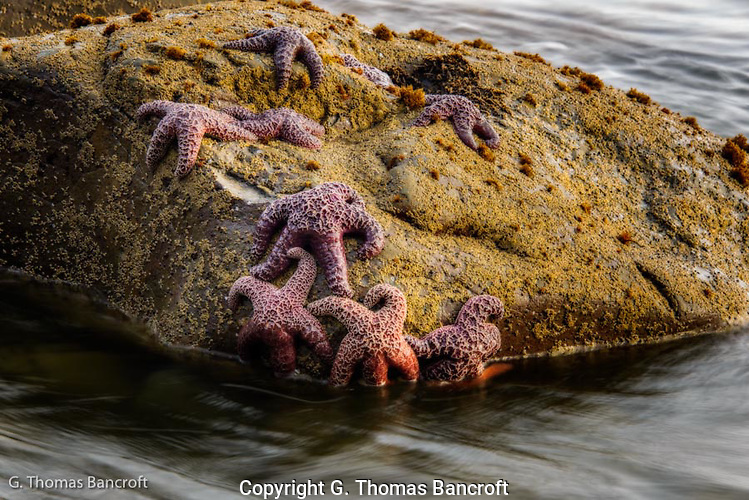 The starfish feed on barnacles and mussels; which were common on the rocks. 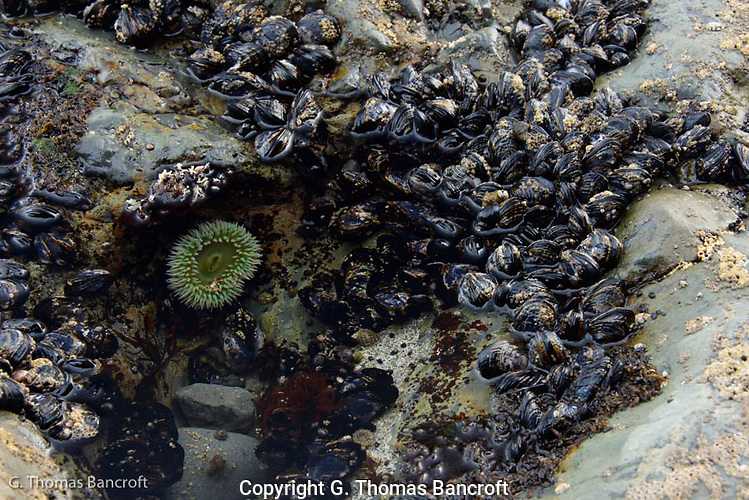 Several mussel patches were a yard or more across and contained hundreds of mussels. The mussels do best above the zone that the starfish can reach. 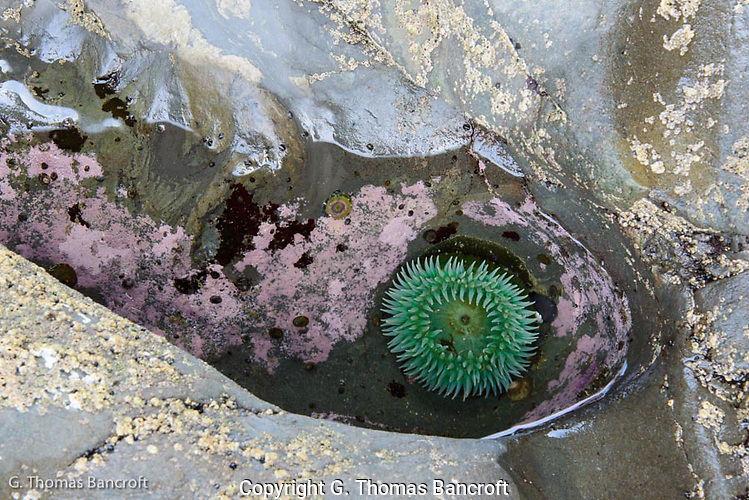 The giant green sea anemones were in several of the pools. The tentacles radiate out from its top and the anemone waves these appendages with their stinging cell through the water to capture possible prey. The sunset was worth the wait. Watching the waves flow in and out as the sky gradually changed was serene. After the sunset, I headed down the beach to return to my campsite. As I walked through the twilight, a harbor seal poked its head out of the water to study me. It swam parallel to me for a hundred yards before it gave up interest in me and returned to its other activities. What a relaxing afternoon, definitely experiencing wilderness in Washington is a treasure. 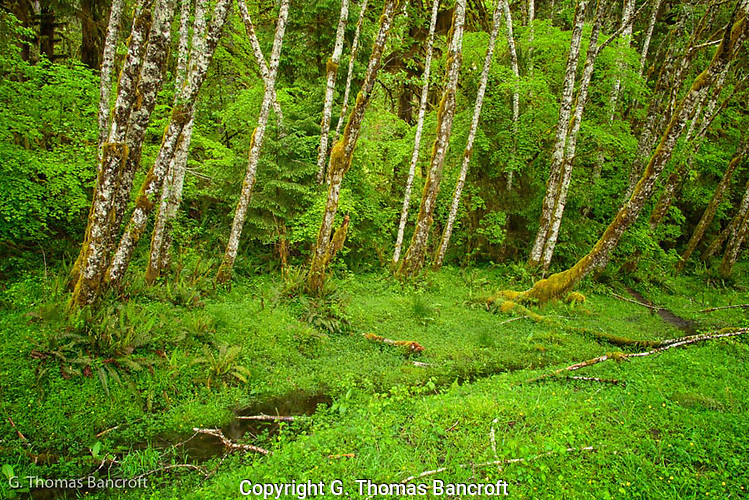 I camped Saturday night (May 11) at Hoh Rainforest Campground along the Hoh River. The rain started about 9:30 in the evening. It was still twilight and the rain gave a soft cast to the landscape. The Hoh Valley receives more than 140 inches of rain a year. That is an incredible 12 feet of rain. The celling in my apartment is a little over 7 feet; 140 inches of rain would almost fill it up twice. Wow! The rain was light and created a tranquil sound as it pattered on the tent. I was close to the edge of the river and could hear the sounds of the water running over rocks and hitting against tree trunks along the bank. I slept well. 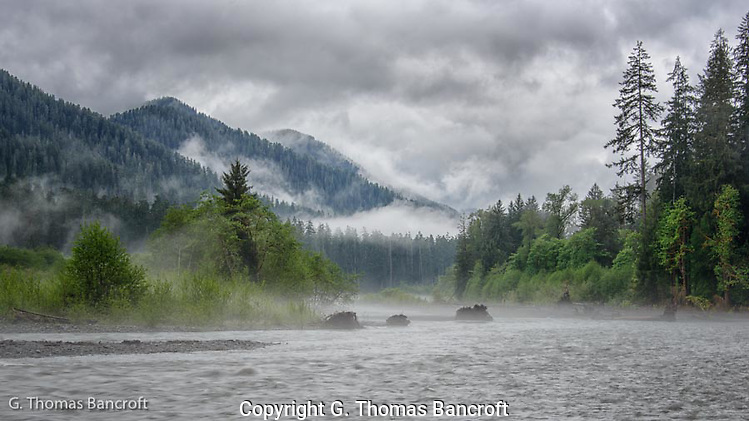 I rose early the next morning and headed up the Hoh River Trail to see how the forest looked in the rain and to look for a place where I could walk along the river. I found a wonderful place a couple of miles up the valley where a side trail headed out to the river. 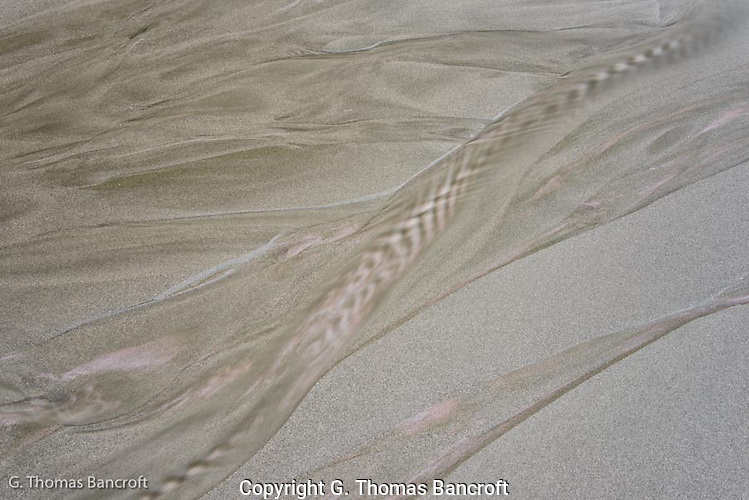 I was able to scramble down a small bank and jump across a small stream onto a sand bar. Alders coming into full leaf lined the small stream. In the morning-wet light, they were just beautiful. The sand bar had a lot of those river rocks that are rounded all around. These rocks varied from an half-inch in length to 4 or 5 inches. I slipped often on the loose rocks as I walked up the sand bar. The rain was really light. For several minutes I didn’t think it was still raining. Only when I looked into shadows could I see droplets falling. I held out my hand to see if it was really raining. Yes, rain was coming down. The forest was draped in low-lying clouds and a thin fog layer clung to the river. The clouds, fog, and color of the forest were constantly changing. The soft light made the trees glow. The fresh light green leaves of the maples and alders stood strongly against the darker needles of the conifers. The clouds constantly changed shape and the forest would peak out for a while along the slopes of the mountains and then disappear as a lower cloud drifted through. I stood for quite a while enjoying the serene setting, oblivious to the rain drizzling on my jacket, hat and face. After a while, I headed back to the trail to work my way down to my car, having been blessed to experience this wilderness on a fabulous day! The drift wood logs were piled on the beach like so many Lincoln logs or legos thrown in a pile along the edge of a rug. The differences being that these logs were massive in size. Some were several feet in diameter and dozens of yard long. I had to weave between logs and climb over them to reach the open beach. 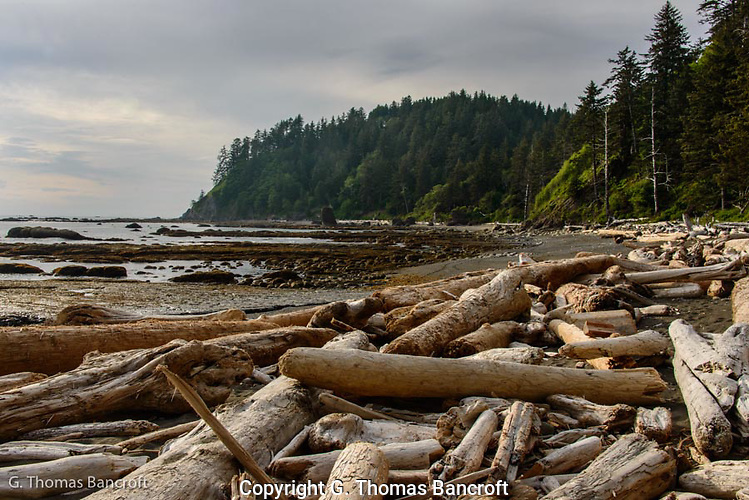 In some places the logs covered wide patches at just above normal high tide and in other places where the hill came sharply down to the beach they were only a few logs along the shore. 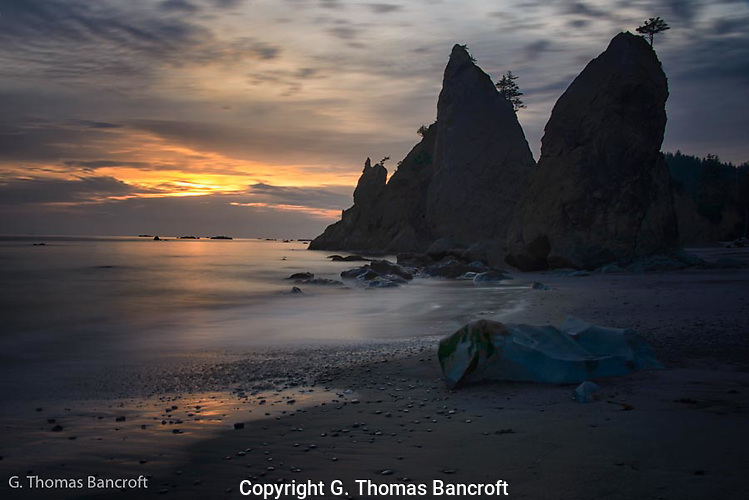 I was hiking north along Rialto Beach into the Olympic Wilderness Area, a spectacular stretch of undeveloped beach protected in its natural state through the Wilderness Act and the Park Service. 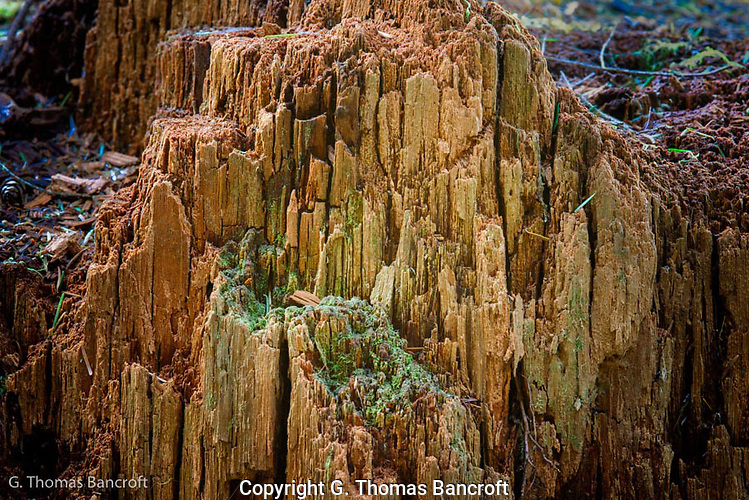 These logs were entire trees that had fallen into rivers and streams through erosion and storms and floated at flood times down to the ocean or directly into the ocean from the shoreline. Some still had the root system at their base. Many were snapped along their trunks showing the force of water, floods and tides. The force the storm had to push these logs into the piles on the beach must have been impressive. The park service warns hikers that logs in the surf can be extremely dangerous. It would be fun to watch a storm from high ground to see how it moves these pieces. 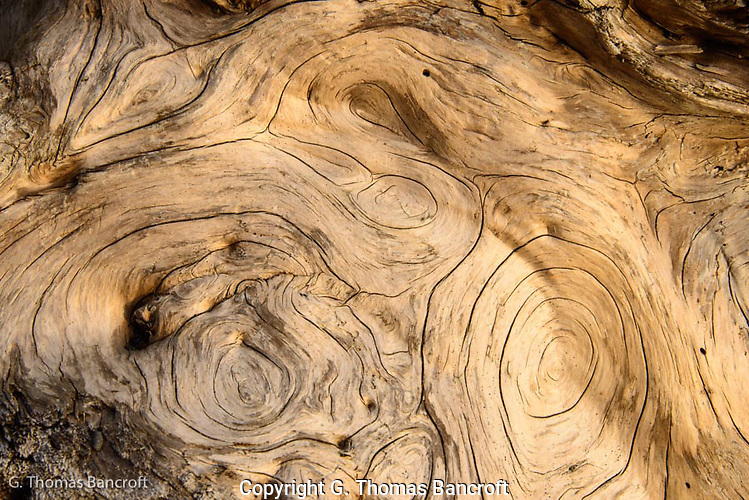 I was fascinated by the designs formed in the wood. The logs were bleached by the combination of salt water and time in the rain and sun. Cracks formed along the grain of the wood and across the grain. In places were the grain was intricate, the designs were elaborate. It was especially fun to study the stump ends of the logs were the roots and trunk came together. These places often had whorls and elaborate patterns. I followed some of the cracks with my finger to trace out the design. 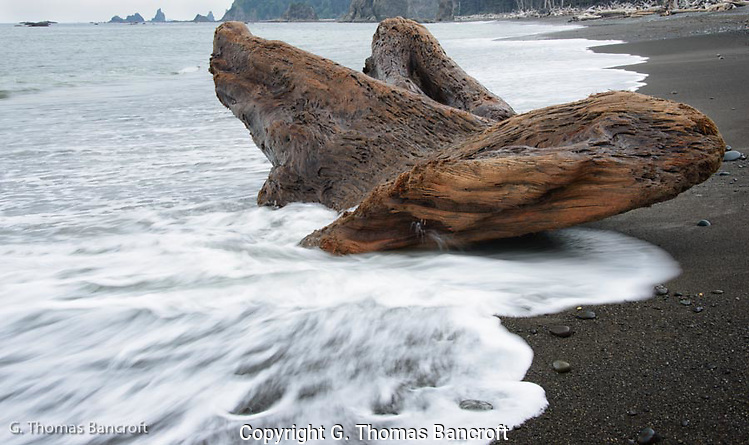 How long does a log stay on the beach and how long until it decays? Fascinating to think about this dynamics and how it influences the ecology of these beaches. I didn’t see partially decayed logs. My guess is the storm tides would disintegrate a decaying log pretty quickly. 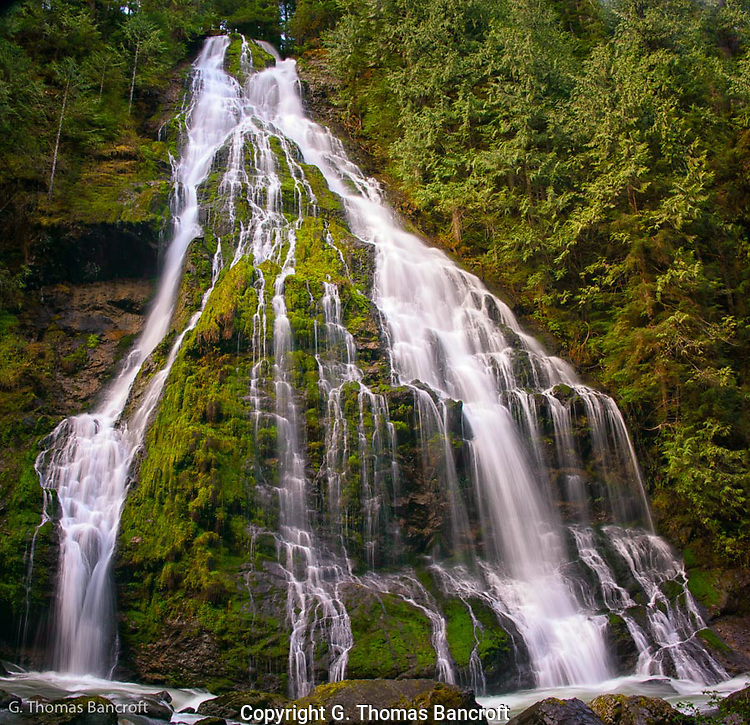 The Boulder River Wilderness is nestled in the mountain just east of Arlington, Washington. I arrived a little before 6AM to hike the trail into the wilderness. The sun was cresting the tops of the mountains but it would be awhile before it reached the valley. I was hoping to see the landscape in the soft pre-sun light. All through the hike I was serenaded by the Pacific version of the Winter Wren. Their song is this long series of melodious notes and trills, often with more than 36 notes per second. This bird is only 4” long and weighs only a third of an ounce yet it blasts out this incredible song and does it almost continuously at this time of year. By weight, the power of their song is more than 10 times that of a rooster! Several places I sat looking for one that seemed to be right on the trail and was never able to actually spot him. They spend their time down in the underbrush and being rufous brown with dark barring they blend in perfectly in the dapple light of the forest floor. The wildflowers were wonderful. 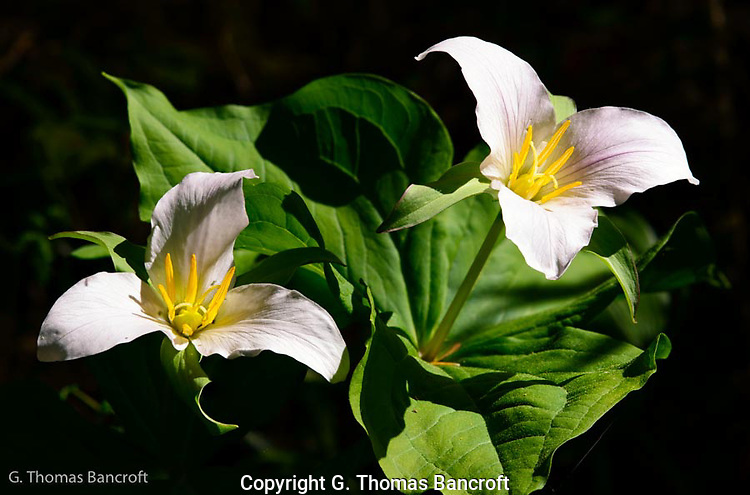 Trilliums were still blooming; many starting to show pink in the pedals indicating that they were about done. 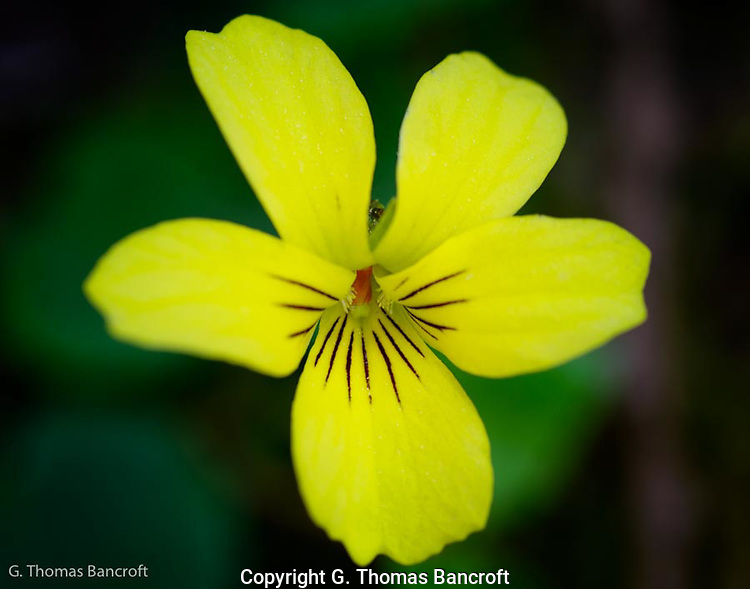 Yellow violets were abundant all along the trail. The Pacific bleeding hearts were almost done, many were withered but I found a few still looking spectacular. A little over a mile into the hike, two waterfalls are along the right side of the valley. It was mesmerizing to watch the water tumble down the cliff side and splash into the stream at the bottom. I worked my way down to the base of the larger falls so I could sit and enjoy the serene setting. With the snowmelt, a lot of water is coming over the falls. The larger waterfall has two main courses down the cliff and a lot of smaller ones. Here is a video of the water tumbling down and the sounds of the falls in action. Let me know what you think? 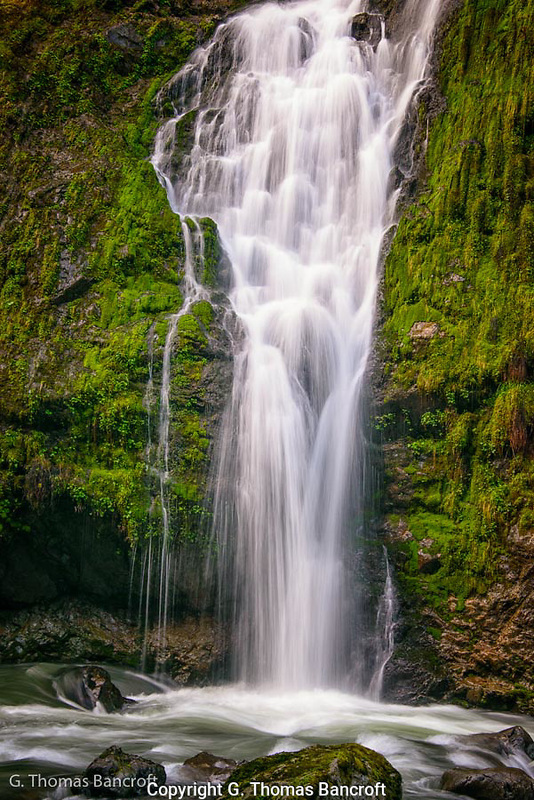 This is a wonderful hike to take and a chance to enjoy the wonderful wildness of the Pacific Northwest. I climbed out of my car to the sounds of Dark-eyed Juncos singing away and the raucous call of a Steller’s Jay. The sun had not quite come above the horizon. A short walk through some douglas firs put me out on the prairie. The landscape is this series of gentle undulating mounds that apparently are a result of the last glaciation in the Pacific Northwest. The soil is very well drained because of the stones and cobbles that dominate it. This forms ideal habitat for prairie plants. 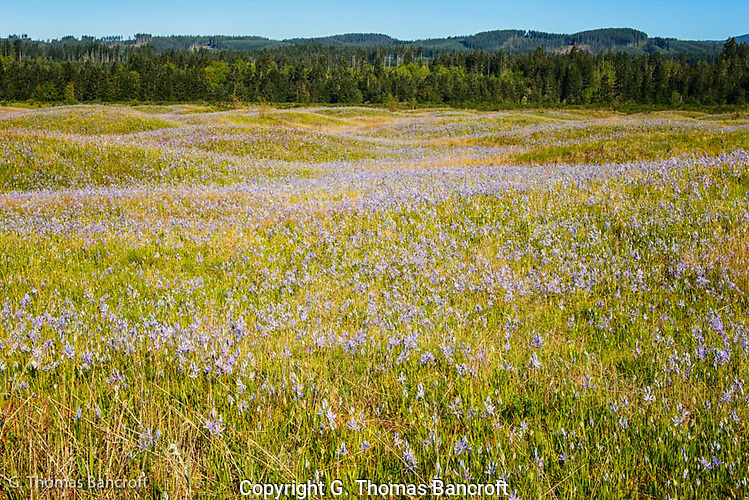 This preserve is just south of Olympia near Littlerock, Washington. The managers are actively working to restore this unique habitat that is home to a number of fascinating plants and animals. Oregon oaks and douglas firs had started to invade parts of the prairie. Scot’s broom is also a threat to this habitat; this is not native to this area and can rapidly spread. 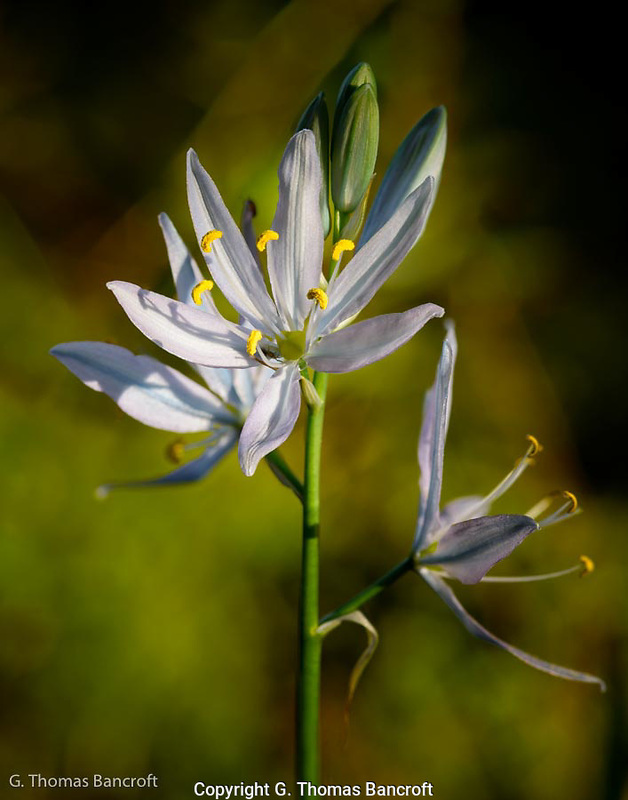 Local Native Americans use to burn this habitat because fires encourage the growth camas lilies. The bulbs are good to eat and this plant does very well following fires. 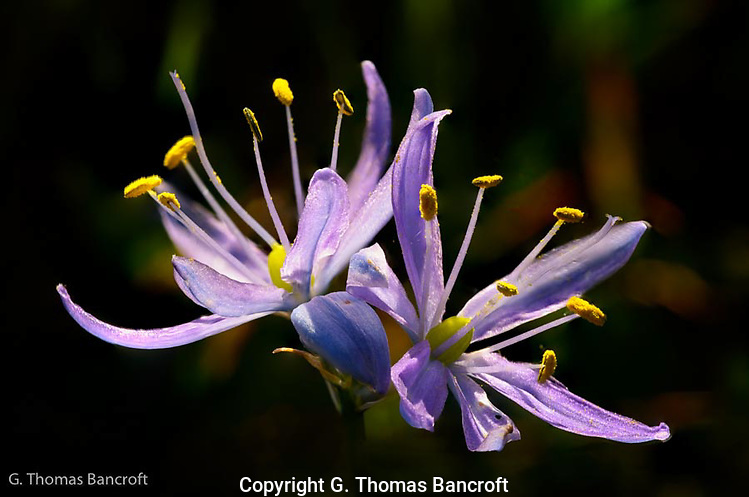 I was sitting on the ground to photograph a camas lily when I heard a loud buzz over my shoulder. I twisted around to watch a large bumblebee land on a lily flower right beside me. 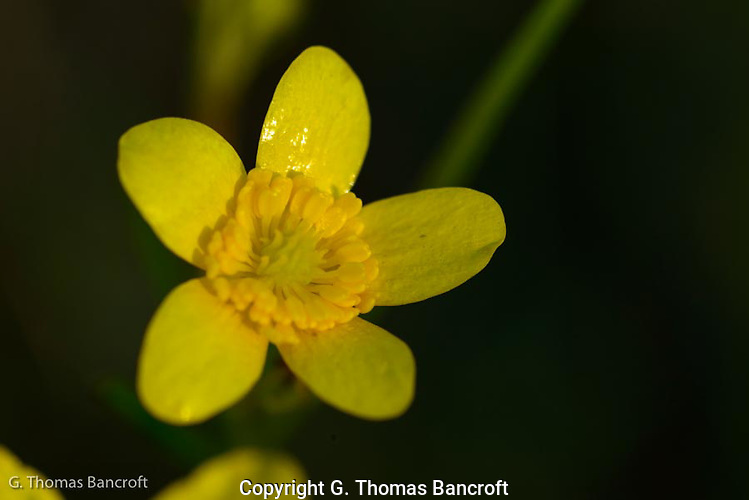 These flowers are small, an inch or so across, and on a thin stalk. The bumblebee was so heavy that the bee and flower bent upside down. The bee stayed only a few seconds before it moved to another nearby flower. I watched the bee work a series of flowers over the next five minutes before the bee flew out of my sight. Each flower snapped back upright when the bee left. Several butterflies require this habitat for their life cycle. I may not have stayed late enough into the morning to find them out flying around because I didn’t see one. I plan to return later in the year to look for them. Savannah Sparrows were calling at regular intervals along the trail. I watched several sing on bushes or isolated trees. I stopped walking when I heard the wonderful melody of the Western Meadowlark. Their flutelike song is a series of whistles and gurgling warbles. I spotted the bird on top of a small tree where it was proclaiming its ownership of the surround prairie. The yellow belly with black V was easily visible from a distance. I found it fascinating to hike through this unique habitat and am so happy that my friends told me about this place. I plan to return a few times during this year to see the succession of flowers and look for butterflies. 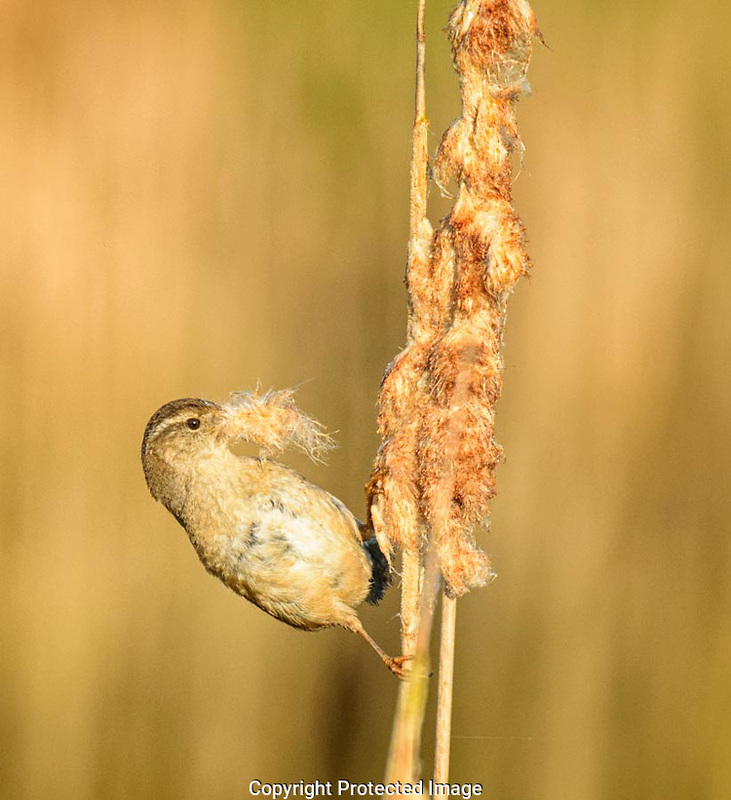 As I started down the trail toward Spencer Island, the gurgling and raspy song of the Marsh Wren filled the air. 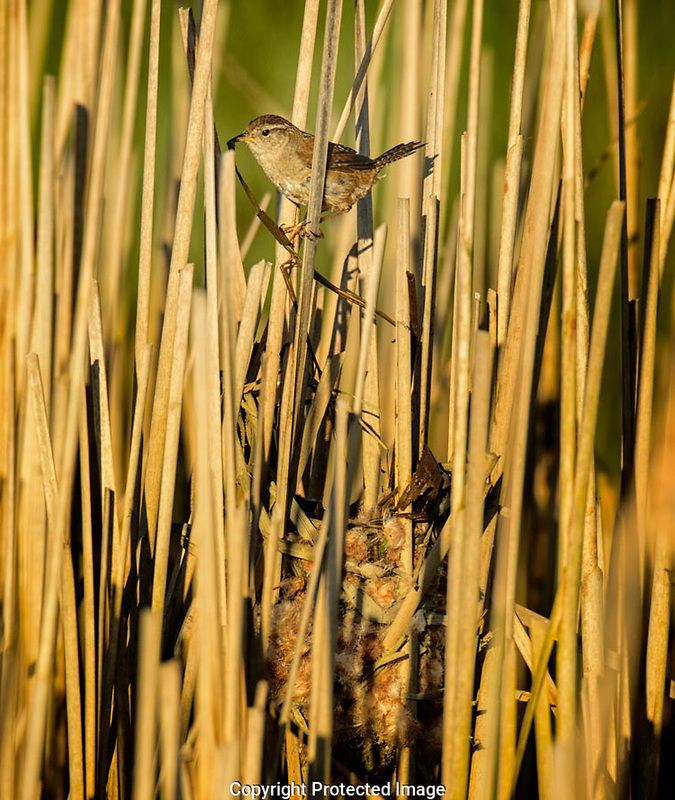 Cattail patches are in the wetlands on both sides of the trail and at regular intervals I could hear a male wren declare loudly that this patch of cattails belong to him. Males in western Washington have a large repertoire of songs with more than 100 different ones. Adjacent males spend a great deal of time in vocal combat. Song is the primary way they defend a territory and having a territory is critical for attracting a mate. I saw several males actively carrying nesting materials. Males will build multiple nests as part of their effort to find a mate. A female may take one of these or may build her own nest once she picks a male. 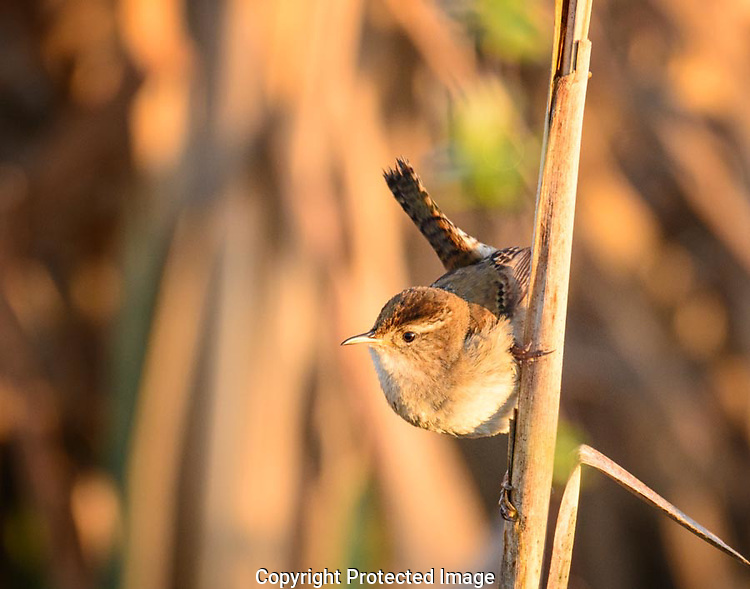 In Washington, Marsh Wrens are polygamous and a male with a prime territory may be able to attract more than one female. On the boardwalk on Spencer Island, I watched for 30 minutes one male actively constructing its nest. The nest was woven between several cattail stalks about 2 feet above the water. The nest cup was complete and the male was working on building the dome over the nest to form the enclosed nest cavity. He flew down to the water to grab a strip of cattail leaf and carry it up to the nest where he proceeded to weave it into his structure. Jumping in and out of the nest as he pulled the strand to where he wanted it. Ever few seconds during this process, he would stop and sing loudly. After several trips with cattail leaves, he would fly to an old cattail spike which still had down and pull piece of down off to take back for lining the inside of the cavity. About every 5 minutes or so, the male would make a flight out to one or another corner of its territory, sing a few songs and then return to nest building. It takes them about 9 or 10 hours to complete a nest and they do this over several days. He was singing away as I finally walked on down the trail. 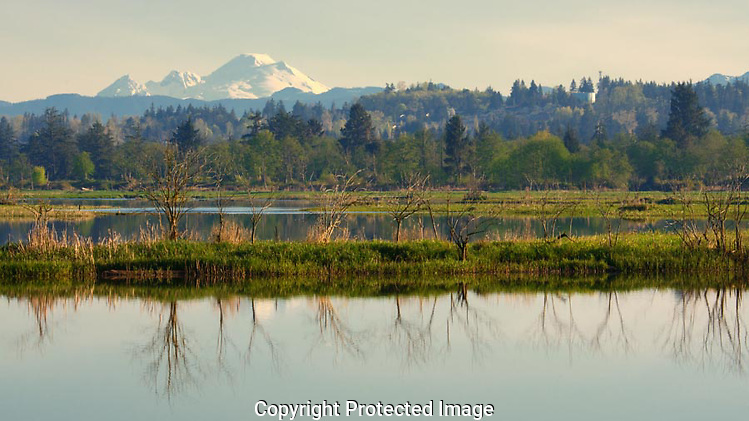 Spencer Island is protected and has several loops on dikes that you can walk around the marsh habitat. I watched several green-winged teal feeding in the shallows and a great-blue heron squawked and flew off as I rounded a corner. White-crowned Sparrows, Song Sparrows, and Spotted Towhees were singing loudly in the bushes along the trail. 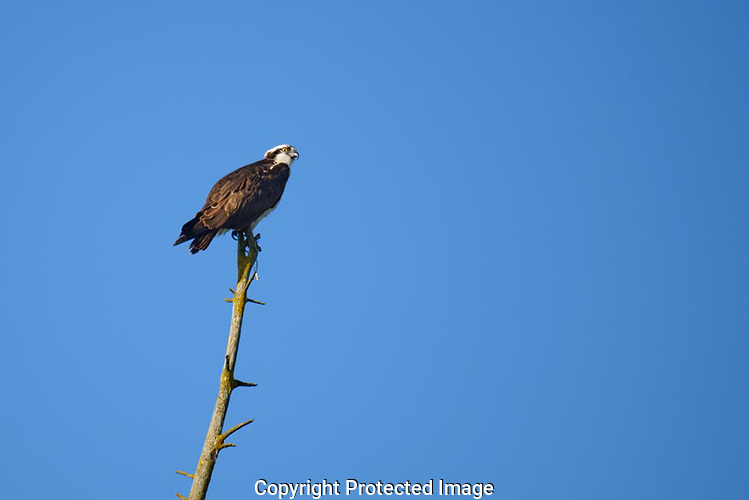 An Osprey sat on top of a dead snag and was quite picturesque against the blue sky. An adult Bald Eagle flew in at one point and scattered the teal. The walk was very pleasant and a nice way to spend the morning.